Rockstar Energy Racing and Jason Anderson headed north to the 46th annual Hangtown Motocross Classic in Rancho Cordova, CA for round 2 of the outdoor season. After just missing a podium by less than a lap at Glen Helen, Anderson was eager to line up again. He wouldn't be alone this time though as Joey Savatgy made his return to racing after sitting out the entire Supercross season with injury. After a bit of a heartbreak at round 1, Jason was still able to keep his head up with a positive attitude heading into Hangtown. That's something he's been able to constantly do throughout 2014 when he is struck by adversity. Things were looking very good after the final 250 qualifying practice when he put himself on the board with the 2nd fastest time. The times from the first practice were faster, but did not even come close to mimicking what the track would be like come race time. This particular track has always been known for being very rough and extremely difficult. It may not have the biggest bumps, but it can definitely boast the most inconsistent terrain due to the amount of rice hulls brought in by the truck load. It is a suspension technicians nightmare as there is no way to make any bike work around the whole track. 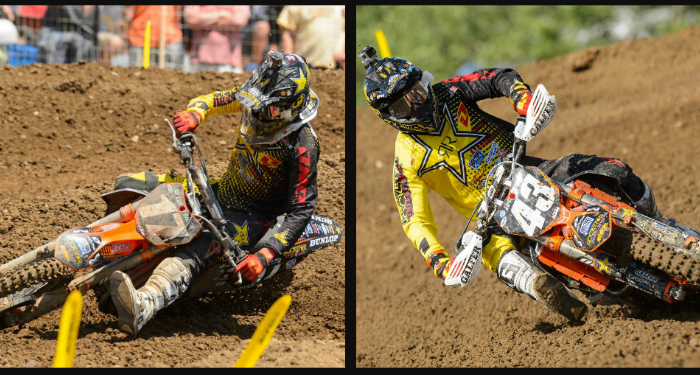 As the gate dropped for the first moto, Anderson got his best start of the year thus far by several positions. He knows the need to strike fast on the first lap and not let the leaders get too far away. Jason made an aggressive move to dive into a rut and make a pass, but lost his front end when he hit a slick spot going in. He was then hit from behind costing him more time. He remounted in about last place. Even though he had another little mistake mid moto, he was still able to climb back into the top ten by the end. A very commendable result considering the circumstances. JA didn't have much time to recover after his fierce moto 1 battle, as the riders only have a short gap in between. His gate pick in the 2nd go around wouldn't be as good as the first and it showed in the result of his start. He moved through the pack once again and was able to finish a solid 4th place. With the toughness of the track claiming some of his top competitors, Anderson's efforts moved him up into 6th overall in the series standings. Jason Anderson: "Hangtown was alright and I ended up 6th. I just had a bad first moto. I regrouped for the 2nd moto and got 4th. Not too bad of a day, but I'm just looking to progress." Joey Savatgy was very excited to finally compete aboard his Rockstar Energy Racing KTM for the first time since joining the team for the '14 season. He hasn't been able to catch a break from the injury bug for quite some time. This weekend not only marked his first race for the team, but also his first in nearly a year. Coming back from a shoulder injury on what could be the toughest course on that joint to do so, was going to be tough and he knew it. He clearly did the best he could and even ran with the front pack for several laps in both motos. He showed that he still has the speed to be up there but the day clearly took it's toll on him and his shoulder. In the end though, he finished without any crashes and left the track healthy and eager to continue to improve. Joey Savatgy: "My day, I guess was positive, I stayed off the ground both motos. The first moto I got a 14th. The second moto I'm not even sure what I got. I started fading and my shoulder was hurting. Still a positive day, made it through all the laps and going to build off that for next weekend." The team will leave California for Round 3 and mile high elevation in Lakewood, CO next weekend. Anderson will look to have a good day with 2 solid motos and get himself back on the podium. Savatgy will move forward racing himself into shape as his shoulder heals and gets stronger throughout the week.